Photo by Jonathan Hession ©2014 HISTORY®. All Rights Reserved. Photo by Bernard Walsh ©2014 HISTORY®. All Rights Reserved. 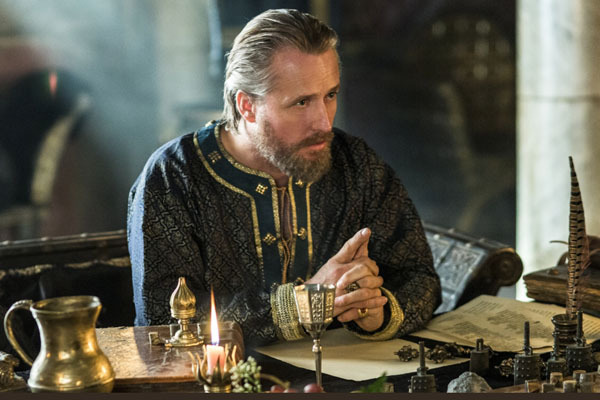 HISTORY® channel has delved very successfully into the 8th century, bringing the most accurate portrayal yet of the medieval Norse, in the acclaimed series VIKINGS. 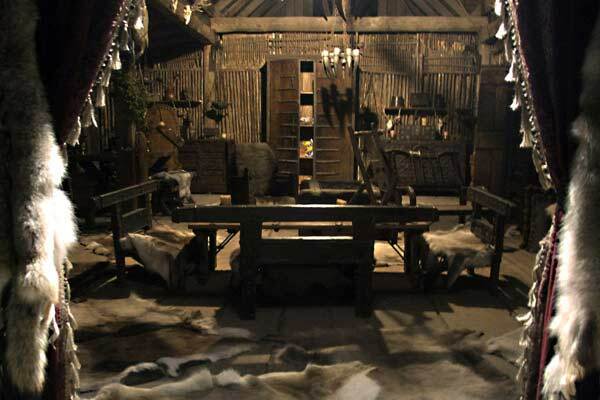 Turner and Production Designer Tom Conroy created incredibly realistic sets for the first season, giving us detailed glimpses into the Viking way of life. 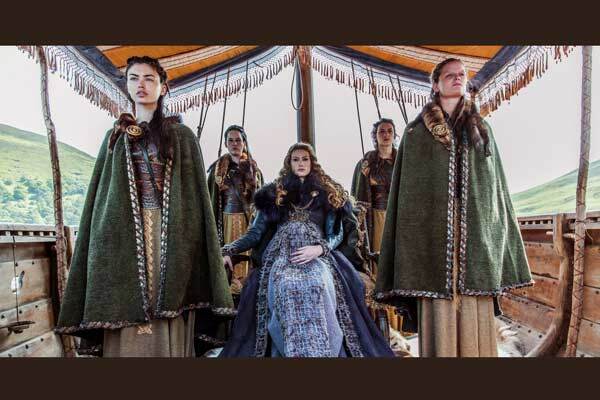 For the second season, Production Designer Mark Geraghty came aboard and worked with Turner and teams to not only keep continuity, but to bring it forward, unveiling even more of the world of the Vikings, and those beyond their shores. 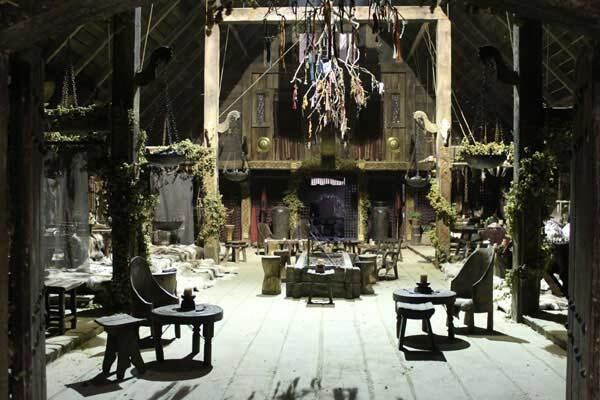 SET DECOR: How much are you directly involved with the sets? 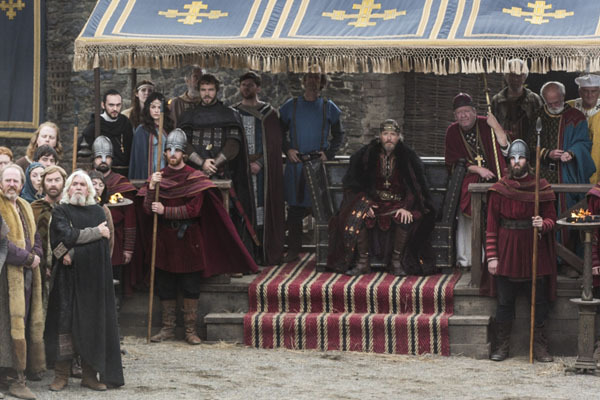 Creator/Showrunner Michael Hirst: Well, of course, I am involved to some degree because as the showrunner, everyone is supposed to consult me about everything—some things I enjoy being consulted about, and some things I’d rather not! I think I’m a very visual writer. 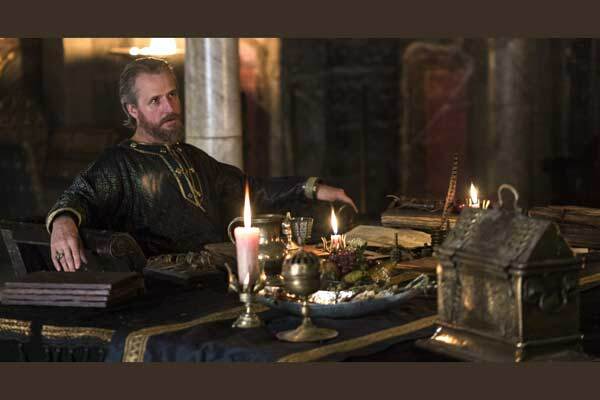 What I tend to do if I write a scene where there is a painting or something that has inspired me visually, I will reference that, and then…whether with Tom, or Mark or Jil…begins a discussion about not only how the scenes are going to look, but how the whole episode is going to look. Hirst: Yes, exactly. When we started, there was a big premium on being as realistic as we could be. We wanted to make the statement that this wasn’t fantasy, this was the real world. The houses in Scandinavia actually didn’t have any windows because the winter is so long. And of course the colors…if you’re concentrating on grays and browns, the moment you introduce red, or blood, it really stands out. That was another choice we made, to emphasize that contrast. 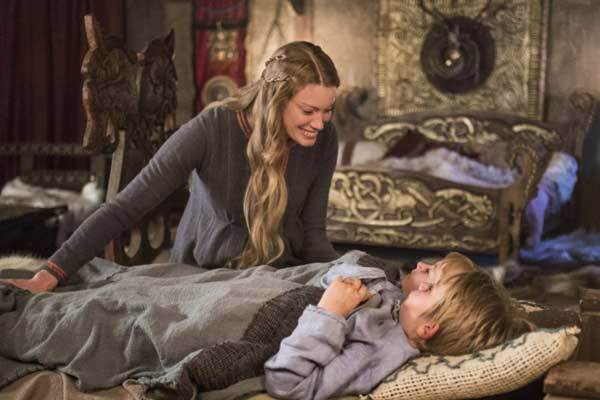 In the second season, we felt more comfortable and more confident about the portrayal. We said, “Let’s open things out a bit. Let’s get some sunlight in here and let’s get a little more color balance.” So we did that, and I think it, again, looks fantastic. But it’s because we had established already a level of authenticity. And I think we needed to do both. 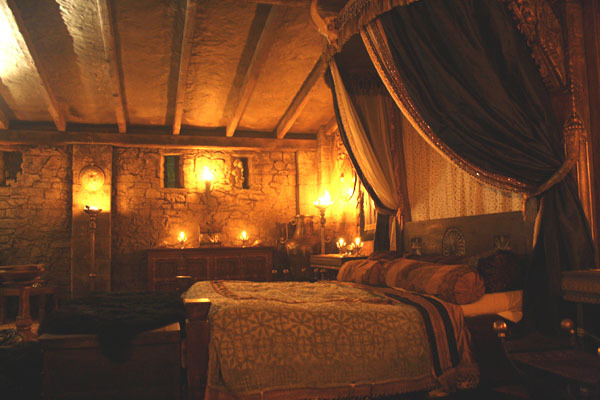 And of course, we were going on to different things in the second season, especially Wessex, with Roman remains and Roman baths and a totally different aesthetic. And that was a challenge! First, I was providing a lot of pictures and information, then a historical consultant was brought in and kept sending pictures of Roman baths and of the ruins of the Roman civilization in England. And it’s so exciting. We created a new world…new because we haven’t seen it shot before, and yet it’s ancient and real because it actually happened. Hirst: That’s right. Jil is wonderful! What I really like about being a showrunner on a series like this is that I’m working with people I consider to be almost geniuses. And they do so much research! I love to delegate, and even if I just suggest something, the results are amazing. I often say, “Well, I don’t suppose we can do that?” And then, they always turn up with something special. When I walk on set, it’s so phenomenal. It’s so real. I’m really proud of that. I think it’s fantastic. 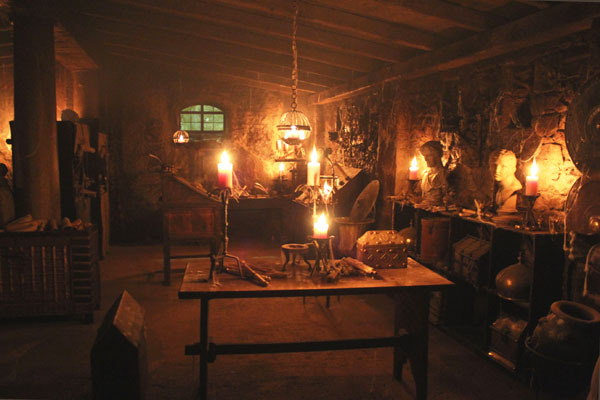 SET DECOR: You speak to the set decorator’s heart, because it is about the details, and making the story authentic through them. 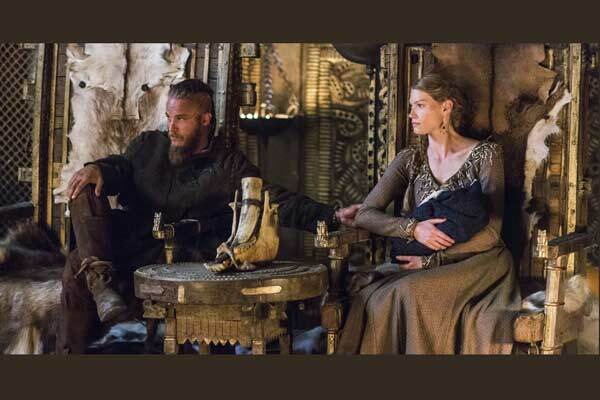 In fact, Jil mentioned last year that one element she used to convey cultural differences was the bread: flatbread for the Vikings, a more oval-shaped loaf for the Saxons. And it seems this season the bread aspect comes through again…from your writing and her presentation…we find that the bread in Wessex is even lighter, from better quality grains. 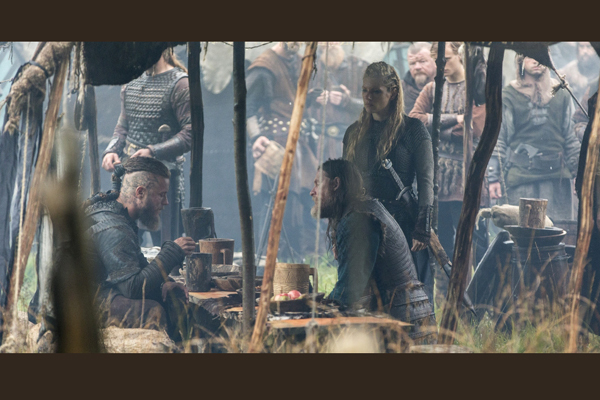 Ragnar [Travis Fimmel] immediately identifies with it, this visual representation of his desire to farm, which he then expresses. Hirst: Yeah, it’s part writing, and part conception. So I just scripted an ongoing thing there, but Jil and all these people working with her participate in imagining, envisioning and creating a real world. And then the actors are put into this world and, as you say, Travis can actually react. I didn’t write that, he did the reaction. Because, of course, he’s looking around him, he’s seeing real things. 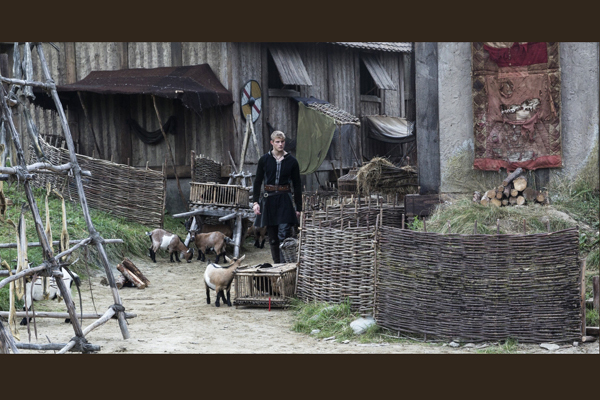 He’s not in front of a CGI screen…he’s in an actual world, with real bread, food, animals, children! We have a real world going on all around them, and we have the actors responding. And I’m watching them and I’m re-writing and I’m trying to accommodate what they are seeing. And it just pushes the story forward. It’s an organic and wonderful process. 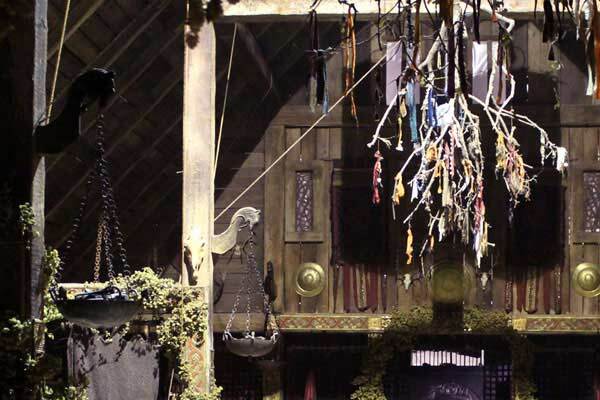 SET DECOR: That’s exactly it, this intertwined responsibility of how it all comes to fruition on the screen. Has there been a particular detail that you specifically asked for or that you found the most interesting? 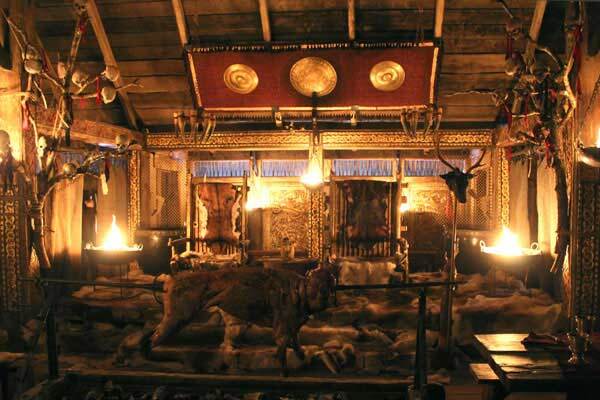 Hirst: When Ragnar’s second wife Princess Aslaug took over this season, she feminized the Great Hall of Kattegat. And that was interesting. It had been very severe and rather harshly lit in the past, but with her influence, it changed slightly. There was more stuff and more color in the Great Hall. Her innate elegance comes through a bit. It was subtle and not everyone would have picked up on that, but I liked it very much. 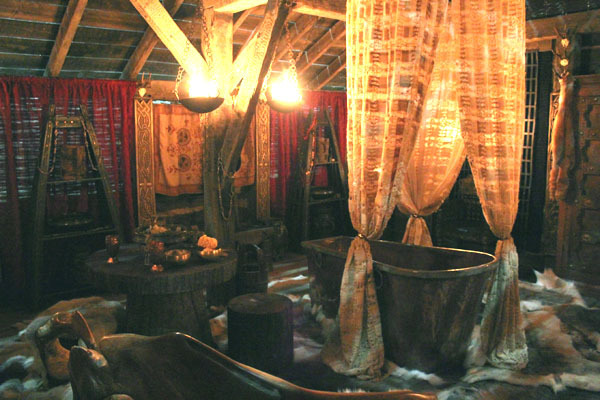 The other thing I really loved was the Roman bath, which was part of the ancient remains in Ecbert’s kingdom, and which he utilizes fully in our Vikings era. The reflective quality of the light was fantastic. We could get reflections from the water all around the walls and the paintings and the alabaster, and then the candlelight. And so it then became intimate, a wonderful environment to shoot in because it was full of flickering colors and light. Water is always important. Director Kari Skogland came on for Season 2, Episodes 7 & 8, and she did a lot of shooting with water, from exteriors like the fjords and streams to all sorts of things inside. Of course, the Vikings were the water-born people, and she’s re-acting to their obsession with water and also how water reflects things. I loved the way it became lyrical. It was all of a piece. It’s not like, “I’ll just add a little bit here.” It’s like going back to basics and saying, “We’re going to make this whole episode about water." I’m just thrilled when someone has a concept like that and then it all flows from there. 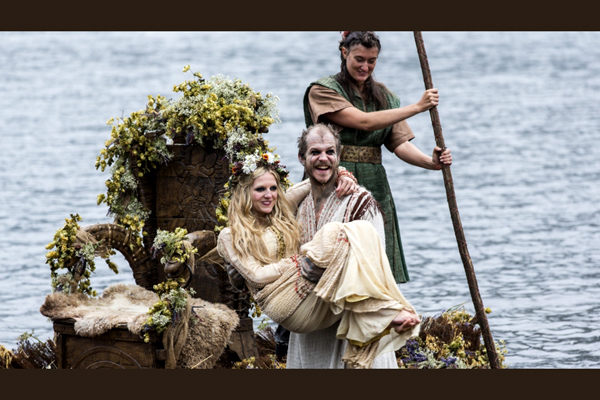 SET DECOR: Such as the beautiful flower-bedecked bridal boat for Floki & Helga’s wedding [Gustaf Skarsgard, Maude Hirst]. 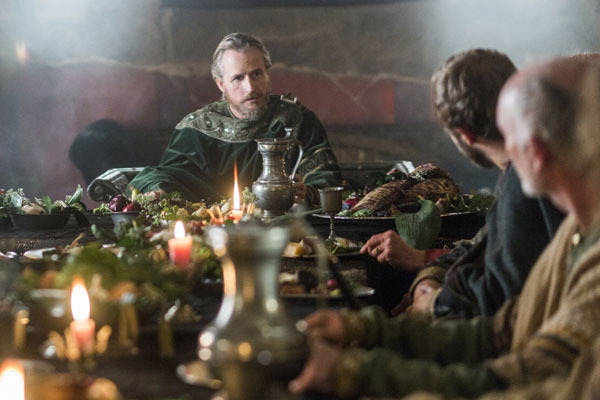 Their ceremony took place waterside, while the other, the Anglo-Saxon wedding/merger in Wessex, was very confined, very contained. Hirst: That was an interesting challenge for the production designer and set decorator to come up with something different. We have this new studio in Ireland, which is absolutely wonderful, with these huge soundstages. In each season we build more and more, and we use the backlots and the landscape outside, which is also fantastic. BUT from the designer and decorator point of view, they always have to come up with something that’s different. 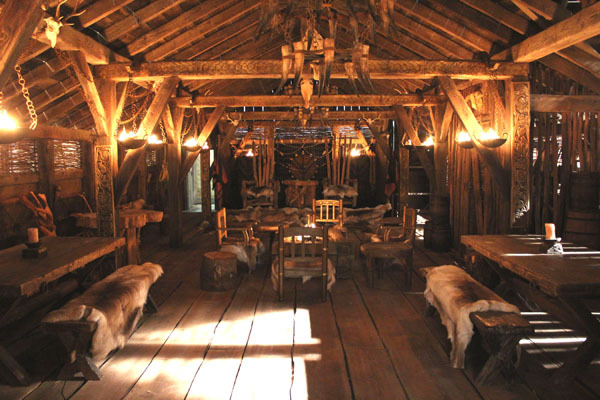 It’s like Lagertha’s new place, Jarl Borg’s place, the Great Hall in Kandastat, all of the Wessex sets. They have to find signature pieces that suggest different worlds. 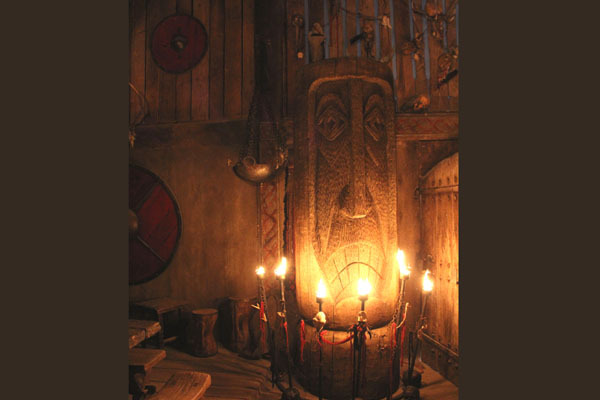 The truth is, actually, I think that probably a Great Hall in Saxon, England looked pretty much like a Great Hall in Scandinavia. They would have been built on the same principles, but we have to make a differentiation. And people like Jil are so amazing at the details that make it different. 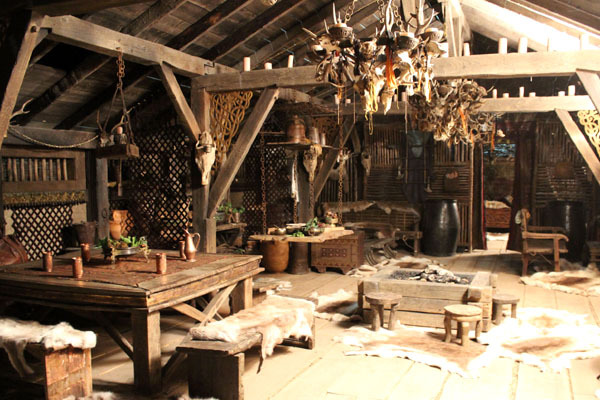 SET DECOR: Have there been any surprises for you with the set decoration? Was there something that delighted you or surprised you? Hirst: To be honest, I’m constantly surprised and delighted. This wonderful reveal that I come down from my office to see…the new set! I’m walked around it and it’s a continuous delight. It’s ALL the things that have been put in there, including things that will never be shown on camera. And it’s the most wonderful and humbling experience. Just to think of the hours of research, then procuring or having things made, getting trucks on the road to bring these things in from places in Europe and wherever, and then all that they have to do to put the set together and make it cohesive and real. I’m very humbled by that side of it. And I do make sure to tell people that I’m very affected by it. I just write things on paper. They have to make it real.